We have two multi-slice, multi-detector CT scanners. The latest one is the state of the art Siemens 64-slice Definition AS system with capability for complex imaging such as CT coronary angiography, coronary calcium scoring and other cardiac imaging; aortic, visceral and peripheral vascular imaging; neuro-vascular and brain imaging with perfusion; virtual colonography; as well as all other CT applications. All studies are reported by our Consultant Radiologists. 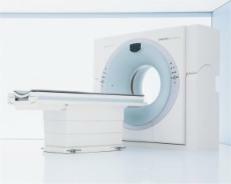 Sample clinical images may be viewed on the Siemens Definition AS website. Want more information about having a CT scan? Please refer to our detailed information leaflet on CT for information on what a CT scan involves. You could also visit the RCR virtual department website CT page and click on the relevant images for information.